(1) Preheat oven to 180°C. 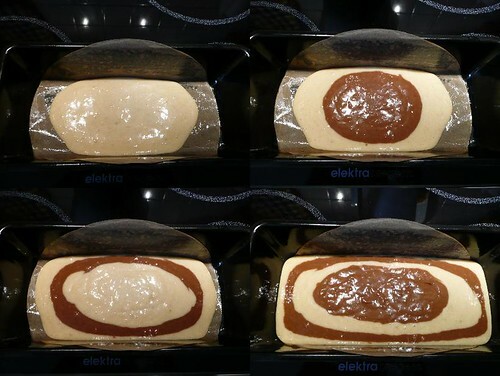 (2) Spread some butter on the bottom and sides of baking pan before lining the pan with baking paper. Lightly grease the baking paper with the remaining butter. Set aside. (3) In a big bowl, whisk together ingredients A. (4) Add ingredients B and whisk well. (5) Remove 1 cup of the batter and place it in another small bowl. Microwave ingredient C to melt it before adding it to the batter. Mix well. 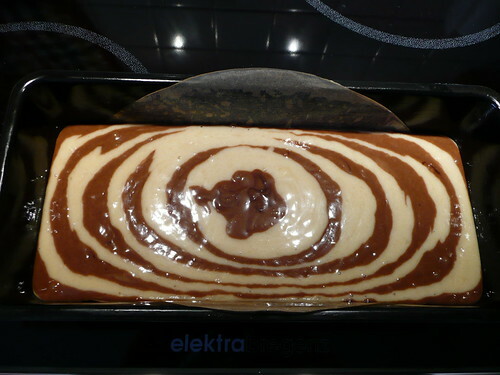 (6) To create the marbling effect: Place a scoop of the white batter in the middle of the baking pan. In the middle of the white batter, pour a scoop of chocolate batter on it. Alternate between the two-coloured batters until all batters are used up. (7) Bake for ~30 minutes or until a skewer inserted in the center comes out clean. (8) Cool on a wire rack and store in an air-tight container. 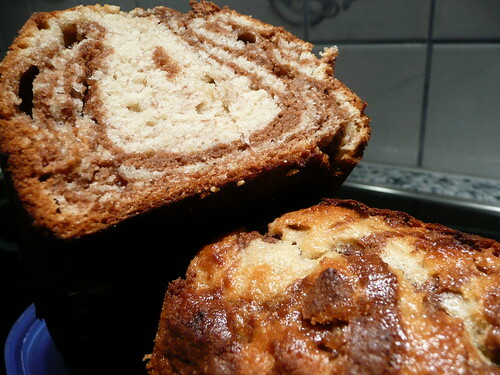 (=) The fragrance of the bananas makes it a hard-to-resist tea time snack.